The Colorado Avalanche Hockey Club announced today that it has signed forward prospect Justin Mercier. 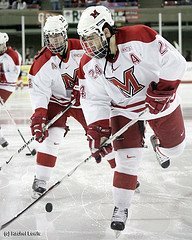 Mercier, 22, spent the last four seasons at Miami University, where he helped lead the RedHawks to the 2009 NCAA championship game by totaling 29 points (14g/15a) in 40 games as a senior. The 5-foot-11, 190-pound forward finished his collegiate career with 104 points (52g/52a) in 157 contests, becoming the first player in school history to record 100 career points and be a part of 100 victories. 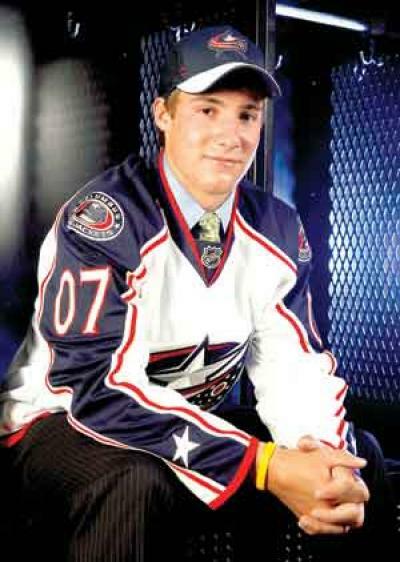 A native of Erie, Pa., Mercier was the Avalanche’s eighth selection (sixth round, 168th overall) in the 2005 Entry Draft. This is a great signing for both the Avalanche and Mercier. Colorado had until August 15th to sign him and by all accounts, Justin got a very fair deal with the Avs. Reports said that Mercier and his agent felt that he was more valuable than the offer that Colorado had originally presented, but the negotiations remained cordial on both sides and a deal was done. While the details of the signing weren’t released, it will most likely be a standard three year entry-level conract that will see him play most of this year and possibly the next in Lake Erie. He adds to a strong group of winger prospects in the Avalanche system and with the youth movement in Colorado, we could possibly see Mercier, who joined Miami’s 100 point club this season, playing for the big club sooner, rather than later. During this, his senior season at Miami, Mercier is taking on more of a leadership role than ever before. While he’s not wearing a letter on his sweater to make that responsibility official, Mercier has taken the lessons he learned from previous leaders of the RedHawks and is trying to use them to help out a young squad. Definitely worth checking out the rest. I expect big things from him this season…I can say in all honesty that Justin is one of the most exciting players I’ve ever watched…love his hustle with and without the puck. 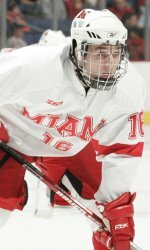 >- Today’s Miami Memory is a Goggin classic. 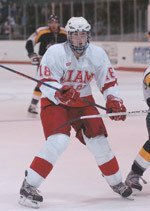 Alec Martinez’ OT goal against the Western Michigan Broncos to send the RedHawks to Detroit and close out Goggin Ice Arena. You can view it at this link. Listening to Dave Allen’s call of the final goal gives me the chills…boy, do I miss that place. – Justin Mercier has been named to the Inside College Hockey preseason All-American third team. No other RedHawks were listed on either the first, second, third or rookie team. Yikes. 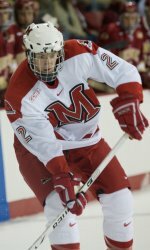 – Former RedHawk Joe Cooper, signed with the Toronto Marlies, has been assigned to the Reading Royals of the ECHL. – CollegeHockeyNews has released their CCHA season preview. The CHN staffers have the RedHawks finishing in third place. With two unproven netminders and a young and inexperienced defense, Miami will have a hard time closing out games in a grueling conference. – Ohio State has some “pre-Miami” audio/video on prepping for the RedHawks this weekend. Here, they have an interview with Defenseman Shane Simms, Captain Zach Pelletier, and Head Coach John Markell. Check it out to see the Bucks’ take on playing one of their in-state rivals. Pelletier sounds pretty confident that OSU can handle the ‘Hawks come this weekend. – The Buckeyes have also released their game notes for the weekend series. Those can be found at this link and a game preview from the Columbus Dispatch, can be found here. – AND…one final note. Photos from the Have Fun Play Hockey clinic from Tuesday night have been posted. Check them out here. 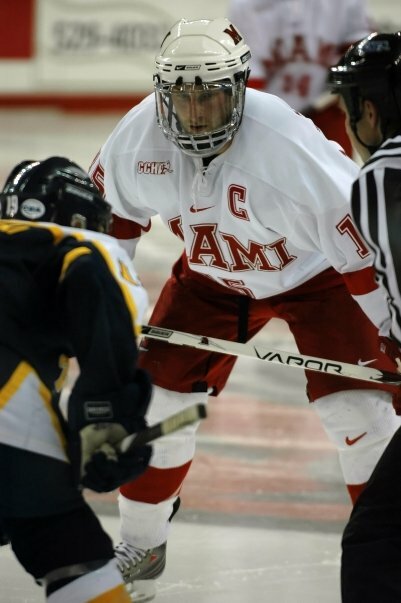 F – Justin Mercier, Sr., Miami A speedy, talented player with a tremendous wrist shot. 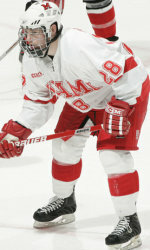 He scored the winning OT goal against Air Force in the first round of the NCAAs last season. He had 25 goals, second on the team behind Ryan Jones, but now we see how he does without some of those other departed stars around him. Led Miami forwards with a plus-22 a year ago. I couldn’t agree more. Speedy and talented are two words that define the Erie, Pennsylvania native. I thought he showed great hustle on Saturday night vs. Ryerson and definitely expect him to have an impressive season. You can view the rest of the list and some players to watch by clicking here.